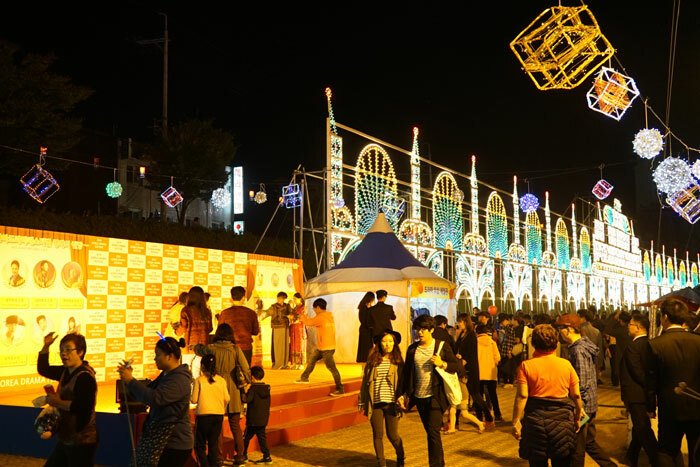 Jinju, a historic city in southwest Korea, has been bustling with the fever of Hallyu, or the “Korean Wave.” This has been due to the Korea Drama Festival 2014, the largest celebration of television dramas in the country, which just dropped its closing curtain. During the festival, held from October 1 to 12, a total of 29 programs, including street concerts, international forums on soap operas, as well as the three main events — the Korea Drama Awards, the Hallyu Concert and the Drama OST Concert — were all held. At this year’s festival, the increased presence of international media and the number of international fans made headlines. Some of the media outlets that visited the festival to cover the event include Shanghai TV, Kyodo News, Proyecto40 of Mexico, MRTV4 from Myanmar and ND TV of India. 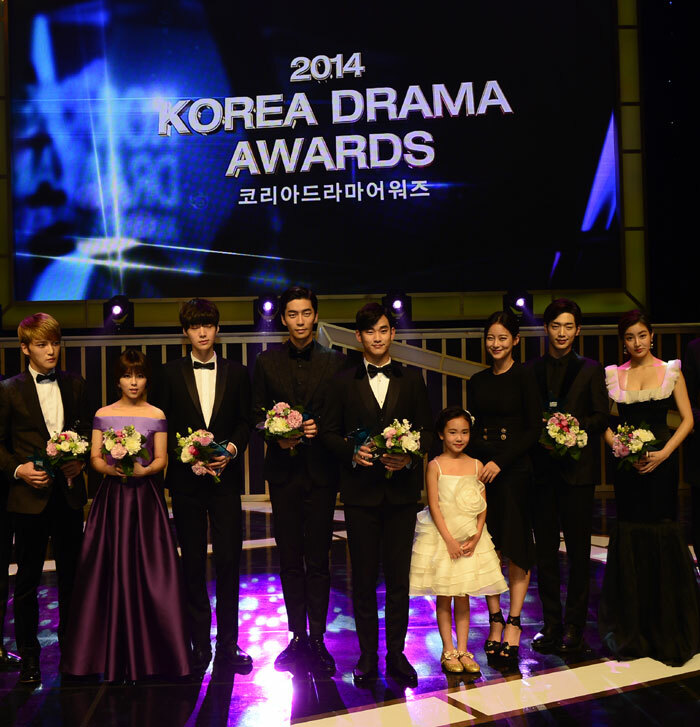 The Korea Drama Awards 2014 were held at the Gyongnam Culture & Art Center on October 1. The grand prize went to Kim Soo-hyun who played the lead male role in “My Love From the Star.” Kim Jae-joong and Oh Yeon-seo won the top excellence awards for actor and actress for their roles in “Triangle” and “Jang Bo-ri is Here,” respectively. 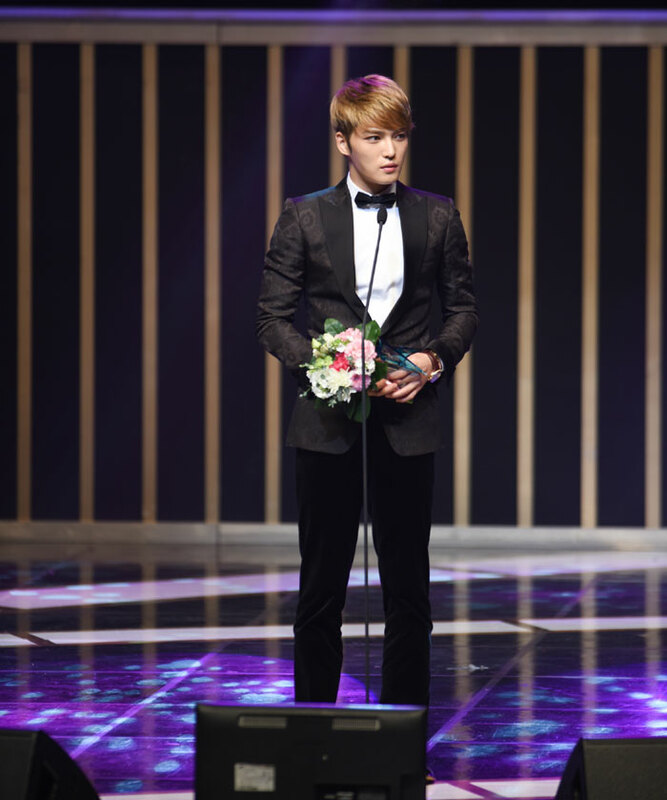 Producer Shin Won-ho of “Reply 1994” won the best production director prize. Winners pose for a picture during the Korea Drama Awards 2014, which took place on October 1 at the Gyongnam Culture & Art Center in Jinju. Kim Soo-hyun, who played the lead male role in “My Love From the Star,” won the grand prize. (From left) Kim Jae-joong, Do-hee, Ahn Jae-hyun, Shin Sung-rok, Kim Soo-hyun, Kim Ji-young, Oh Yeon-seo, Seo Kang-joon and Kang So-ra. 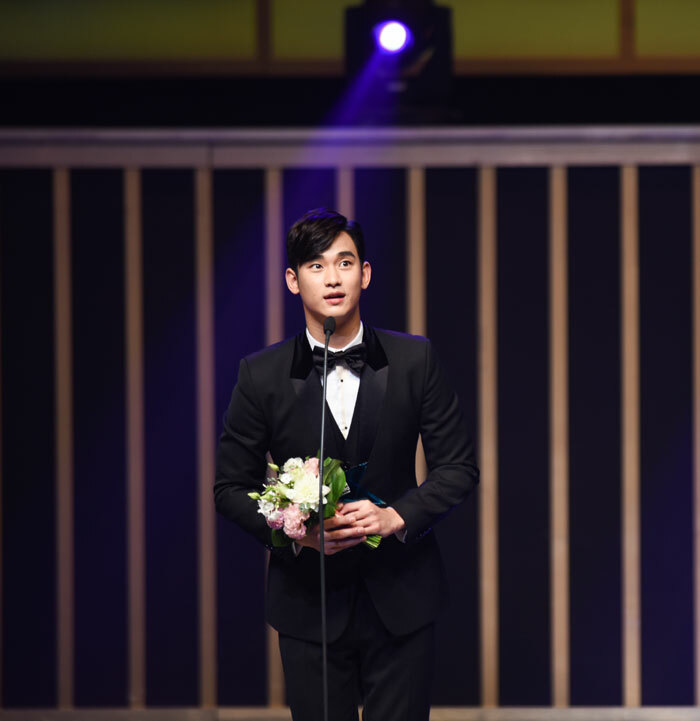 Kim Soo-hyun speaks after receiving the grand prize at the Korea Drama Awards 2014. On October 2, the Hallyu Concert was held where six pop idol groups — Block B, A-JAX, Alice White, BADKIZ, TAHITI and 4L — performed for the audience, bringing them to their feet. BADKIZ performs during the Hallyu Concert. All tickets for the concert were sold-out. The Drama OST Concert featured the Brno Orchestra from the Czech Republic, as well as the popular actresses Choi Jungwon and Jeon Soo-kyung. They sang well-known sound tracks from musicals like “Mama Mia”, the TV show “Beethoven Virus,” and from other films and animated movies. 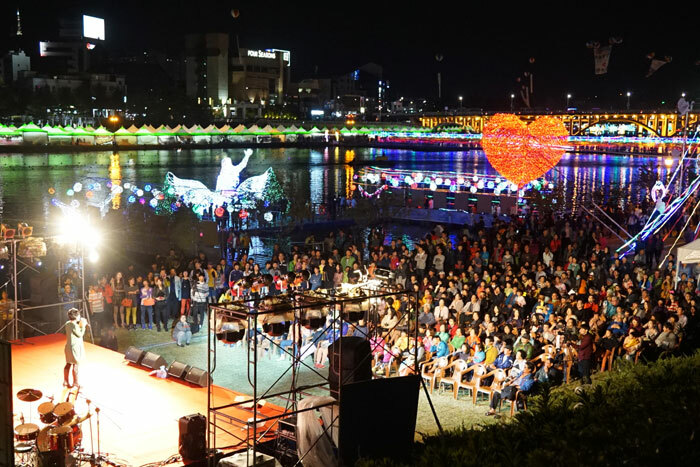 A range of performances are held around Jinju during the Korea Drama Festival. 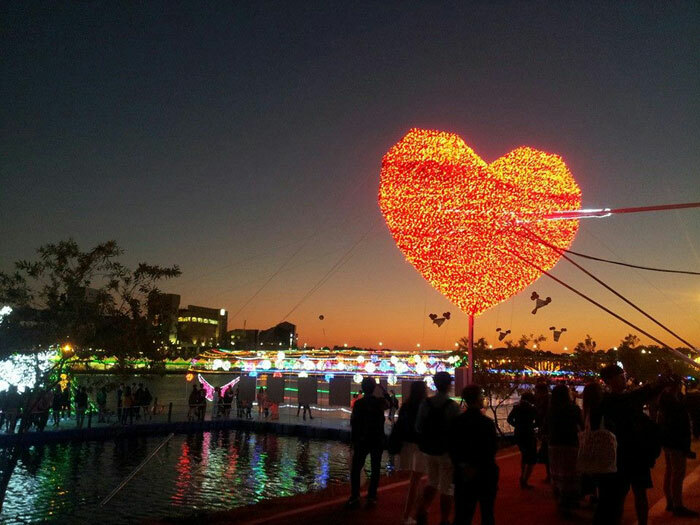 The floating bridge is one of the most popular Korea Drama Festival venues. 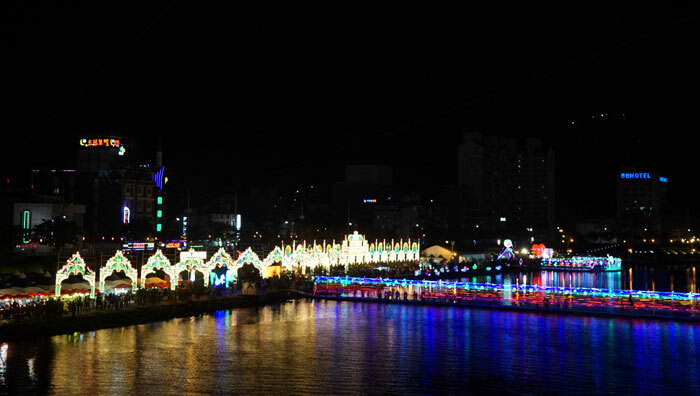 The festival venue is decorated with water-side walkways and light displays for the visitors’ entertainment.